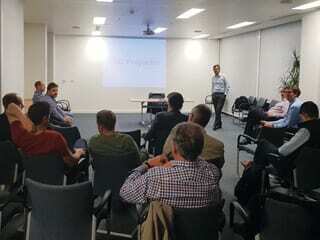 At the October meeting, Paolo Marcassoli from Cescor gave a very interesting talk on the use of Finite Element Method (FEM) in Cathodic Protection Design. 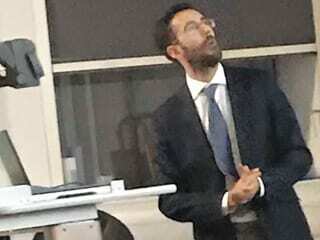 Paolo introduced the advantages of FEM modelling, explained its mathematical principles and presented case studies where the technique had been implemented. Over the past few years the use of computer aided approaches have improved the design of galvanic and impressed current cathodic protection systems. To ensure that protection conditions are achieved at each point of the structure, correct anode spacing is critical. FEM allows accurate analysis of structures with complex geometries, and the impact of various factors on corrosion control, providing precise prediction of protection current distribution. FEM is a numerical technique for solving boundary value problems, it minimalizes an error function, generating a stable solution. It solves simple equations over small subdomains, i.e. finite elements, to approximate more complex equations over a larger domain. Such analysis considers both, the primary current distribution related to electrolyte resistivity and the secondary current distribution related to electrode reactions. Boundary conditions are characterized by electrochemical behaviour of the metallic surface under protection, for example through the Tafel equations. The electrical field is then solved using Laplace equation. The first case study demonstrated the application of FEM on an above ground crude oil storage tank, where the bottom of the tank was protected internally by coating and galvanic anodes, flush-mounted type or zinc ribbon, depending on the water hold-up. This case is described in more detail in the article on page 14. In the second case study Paolo presented how FEM benefits retrofit CP design of offshore assets. This included applications in: offshore platform protected by galvanic anodes, offshore platform retrofitted by impressed current system, subsea pipeline retrofitted by galvanic anode sleds, and Single Point Mooring retrofitted by galvanic anodes clamp and pods. The study showed that FEM modelling in cathodic protection design is a very useful tool that helps to ensure thorough protection of the asset and possible reduction of costs by optimization of anodic system installation, and determining need for a new retrofit system. This was an excellent talk and was well received by the audience. The technique presented is currently widely used in the industry and is recognized by professional organisations. It surely is a step forward in cathodic protection design and will continue to develop in the future. 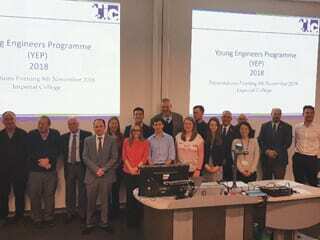 The November meeting was devoted to the presentations from the Young Engineers on the results of their YEP case study of a heat exchanger failure. This was the culmination of 12 months of study by the delegates who have worked through modules that span the breadth and depth of the technologies used in our industry. The YEP delegates and mentors. There was a good deal of questions from the audience after each presentation and following which the judges retired to deliberate. Bill Hedges from BP, on presenting the award, said how hard it had been to select a winner as they were all so good. However there has to be a winning team and that was Team Doggett, who will be travelling to the USA in April 2019 to attend the NACE Conference in Nashville, where a whole programme of events will be arranged. They will post a blog of their activity and learnings on a daily basis on the Institute website. The organisers are grateful to the President and staff of NACE for pledging their support to the winners whilst they are in Nashville by providing free conference registrations, and access to the student award ceremony. The winning team will also present their conference learnings during the London branch 2019 winter series lectures. It’s also interesting to note that Agnieszka of Team Boran, travelled from Poland in 2015, under her own steam, to hear the previous YEP case study presentations, and decided then she wanted to be involved in the next YEP programme. Thanks go to all those involved in the process; the organising committee, the lecturers, the hosts, the mentors, the judges, the delegates, and if course a big thank you to the sponsors of the event, BP. The winning team and mentor, Rob Doggett with Bill Hedges. The second joint meeting of the branch with the SCI London Group was held on 25 October, at their prestigious headquarters in Belgrave Square. This ultra-modern auditorium made for a most comfortable setting and was enjoyed by an attendance of over 60. The evening chairman, John T O’Shea, a Past President of ICorr, began the procedures by thanking Dr Fred Parrett, currently Hon. Treasurer of the SCI London Section, for all his work in helping to organise this event. John O’Shea introducing the evening. The first presentation “A Fighting Ship” was based around the Mary-Rose project at Portsmouth. This was given by Professor Eleanor Schofield, Head of Conservation and Collections Care at the Mary Rose Trust. 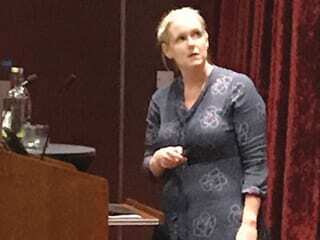 Eleanor graduated from Imperial College, where she also received her PhD in Material Science. She has recently received an Honorary Chair at the University of Kent, at Canterbury. Professor Schofield began her talk by correcting the too often quoted story that the Mary Rose sank in 1545 on her maiden voyage. In fact she was built in 1510 and served for 34 years as the flagship of Henry VIII’s navy in many battles, particularly in wars against France. Following the lifting of the ship out of the seabed mud, the timber hull was treated over many years by spraying with water and polyethylene glycol to prevent further deterioration once it was exposed to the air. Perhaps less well known is the work in restoring and maintaining over 19,000 artefacts that had also been recovered. A significant part of the collection was the 1200 + iron cannonballs, which had been exposed to sea-water since the ship sank, and which were in danger of corrosion when exposed to the air due to the chloride in sea-water. It was vital that ways were found of preserving the these, as it was recognised that while the cannons were made to last and be used many times, the cannonballs were only needed for a one-off use, and thus greatly inferior in their quality and standard of manufacture. Initially researchers attempted to remove chloride from the cannonballs, by soaking in water with and without chemical treatment. Chloride reduction by heating in an atmosphere of hydrogen was also attempted, but unfortunately these methods did not successfully prevent disintegration when they were later put on display. To better understand this problem, Professor Schofield, established a joint research project with the department of archaeology at UCL and the UK Diamond Light Source in Didcot which is the UK’s national synchrotron. This works like a giant microscope, harnessing the power of electrons to produce penetrating bright light X-rays, which combined with absorption spectroscopy, and fluorescence mapping, made it possible to visualise the differences in the corrosion profiles. These could be traced to the treatments applied in the 35 years since the cannon balls were recovered with the Mary Rose. The results revealed detailed maps of the elements involved in the corrosive process, giving an unprecedented insight into conservation on a molecular scale. This crucial information will help to protect these and other cultural heritage artefacts for many decades to come. 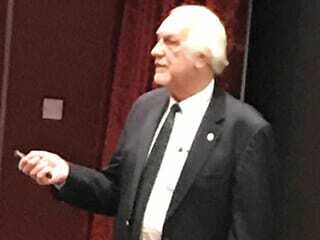 The second presentation, “Fighting Corrosion” was given by Jim Glynn, a previous chairman of London Branch. Jim concentrated on the “dynamic duo” of corrosion protection – a suitable protective coating as the primary source of defence, supported where appropriate by a cathodic protection system to prevent any corrosion occurring at areas of coating damage. It is often commonly believed that rusting is a simple, chemical oxidation reaction – but it is not. Aqueous corrosion is a complex, multi-stage step process which includes electron transfer at the molecular level. Thus these electro-chemical reactions during corrosion can be influenced by the external application of electrical potentials. Under the right circumstances, corrosion can be stopped by applying the appropriate level of negative potential using a DC current supply. Jim presented many examples where the correct conditions of a good coating and a suitable working cathodic potential were present. However, he also described many examples where this was unsuccessful. These included a pipeline coating that had totally disbonded and broken away from the pipeline, due to a higher potential than required being applied, which generated hydrogen gas on the surface of the pipeline, causing the coating damage. He also described Thermally Sprayed Aluminium (TSA) applications, which are excellent protective coatings when properly applied. The aluminium content can act as its own in-built cathodic protection anode. However, in the wrong environment, the aluminium can be quickly used up, and premature failure occurs. Jim expanded his presentation to compare recent case studies of retro-fitting remote anode beds to two similar North Sea platforms which had exceeded their design life, but it was decided that the protection of these structures subsea could be extended using additional cathodic protection. One had been fully coated with coal tar epoxy, while the legs on the other had been left bare, but with a built-in corrosion factor that should have exceeded its expected life. The coated structure required a current output of 1,000 Amps, while the bare steel legs needed around 7,500 Amps, to produce the correct negative potentials, with these high DC currents supplied by banks of adjustable transformer rectifiers located on the platform decks. Jim also interspersed a number of quiz questions, asking the audience to identify some notable “Dynamic Duos” in life, film and comic books, which was well received and considered a fun way to conclude the presentations. The vote of thanks was given by Dr Parrett and he presented the speakers with ICorr engraved pens, as a memento of the evening, which was followed by refreshments and networking in the Garden Rooms. The branch has now moved its activities to the Sir Ian Wood Building, Robert Gordon University (RGU), which provides ‘State of the Art’ Teaching / AV Facilities, and kicked off its new session with some thoughtful insights into the complex issue of Preferential Weld Corrosion (PWC) in a presentation by Neil Gallon and Michael Young of Rosen. This meeting was also the annual joint event with TWI (The Welding Institute) North Scottish Branch. Pre-September meeting networking at the Robert Gordon University. PWC is of increasing concern to many operators, especially in relation to ageing assets. This talk helped explain what exactly PWC was, and discussed some of the many complex welding parameters / considerations and features that can lead to PWC. The talk also discussed procedures for diagnosis of PWC, identification of mitigation options, and highlighted several other difficulties and issues that can arise with both of these aspects in relation to PWC management. 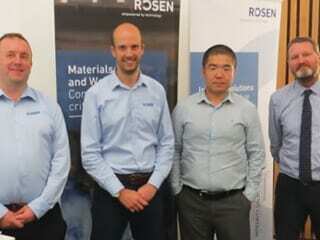 September speakers (L to R), Neil Gallon and Michael Young (of Rosen) with Aberdeen Branch chair Dr Yunnan Gao, and Mark Bragg, Technical Secretary of TWI North Scottish Branch. Immediately preceding the September event, committee Member – Ms. Zahra Lotfi, Snr. Corrosion Engineer, Oceaneering International, gave a presentation to students of the School of Engineering, explaining how corrosion control is an essential part of engineering design and maintenance of every aspect of our lives – our buildings, transport, gas, oil, water industries, and emphasising how all depend for their survival on its prevention. 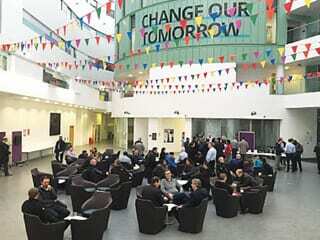 This event was part of a series of talks to Aberdeen University and RGU University students to encourage them to take up free ICorr membership and to become more involved in the corrosion community. 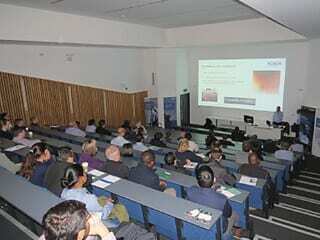 The well attended September event on PWC for subsea and topsides welded systems. 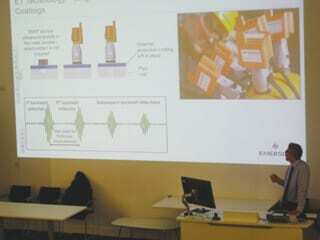 In October, Chris Burke, Technical Consultant / Product Manager of Emerson – Permasense gave a presentation on “Non-intrusive wall thickness monitoring”. Permansense was originally a joint research project between BP and Imperial College, London, and is now part of Emerson, operating worldwide with currently over 20,000 sensor devices in-service. Changes to process operations can often have a significant impact on plant integrity. For example the onset of sand production can be caused through increases in the drawdown on a well and high flowrate from bringing on new or previously shut-in wells, and which can impact on the effectiveness of chemical corrosion inhibitors. Current long-term risk-based asset integrity methodologies cannot predict these sudden operational events, meaning the increased levels of erosion or corrosion that these events can cause can often go undiscovered until the next planned inspection, and risk failing before that. Chris spoke about optimizing plant integrity through continuous wall thickness monitoring using fully wireless ATEX rated equipment for automated UT, that can be very quickly set-up at upstream and downstream energy sites. Chris Burke of Emerson-Permasense, explaining sensor technology. This talk complemented the September one, in that the sensors are now also being installed to monitor PWC, and this will be the subject of a future technical article. The presentation reviewed the increasing use being made by many operators of continuous / automated wall thickness monitors as a means to not only track erosion and corrosion in areas of concern, but as a means of identifying underlying process operations responsible – thereby facilitating and validating corrosion mitigation strategies online so that timely, evidence-based, integrity management decisions can be made. Advantages of these new tools to corrosion / integrity engineers were discussed in great detail, prompting many questions from the large audience on matters relating to sensor installation methods, durability, system size, and data management. Simon Bowcock has been appointed the as the new Young ICorr council member. He will take over from Christian Bridge who made a significant contribution in re-establishing Young Icorr, leading initiatives to increase student membership and organising young professional networking events. This included a very successful event in collaboration with The Welding Institute and the London Materials Society attended by over 50 young engineers. The Institute would like to thank Christian for all his efforts during his tenure and wish him well in his future endeavours. 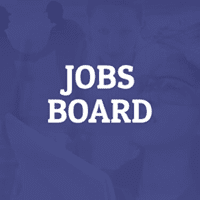 We are looking to proactively engage students from university and looking for volunteers to deliver a 15-minute presentation to materials and corrosion departments around the country. This approach has proven very successful at the University of Oxford with a recent presentation by Chris Bridge and Simon encouraging over 32 students to sign up. In addition, London Branch took part in the recent Imperial College Materials Society career fair with Mash Biagioli manning the ICorr stand. There was a good turnout of students, and 50 of them took away Institute membership packs, however it is too early to determine how successful this was. Each year the Institute of Corrosion bestows a range of internationally-renowned awards in recognition of excellence in corrosion science and engineering, and to reward outstanding service to the Institute and the wider corrosion community. Many of these awards are open to nomination by members of the Institute. Below is a brief description of each award together with details of how to nominate potential candidates. The U.R. Evans Award is the premier scientific award of the Institute of Corrosion and is presented annually for outstanding international achievements in pure or applied corrosion science. The recipient is selected by a Corrosion Science Division panel and presented with a sword and an engraved plaque at the annual Corrosion Science Symposium. 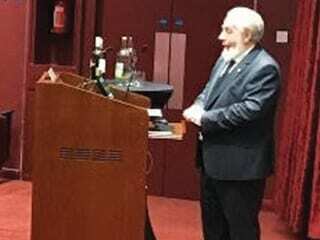 The recipient is also granted Honorary Life Fellowship of the Institute. Nominations may be submitted at any time via email to the CSD Chair, Julian Wharton (J.A.Wharton@soton.ac.uk). The Paul McIntyre Award is presented to a senior corrosion engineer, who, as well as being a leading practitioner in his field, has advanced European collaboration and international standards development. The award consists of an engraved trophy, which is presented at the annual CED Working Day meeting. The recipient is requested to present a brief overview of their activities and encouraged to prepare an article for publication in Corrosion Management. 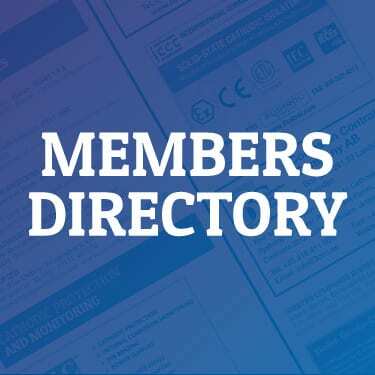 Nominations should be submitted to the CED Chair, Nick Smart (nick.smart@woodplc.com), by 28 February 2019. The H.G. Cole award is in the form of a poignard and is made in recognition of exceptional services to the development of the Institute. It is only awarded on an occasional basis, typically every 5 to 10 years, reflecting the highest possible level of commitment of the recipient to the activities of the Institute. Nomination and selection for this award is administered by the ICorr Awards Committee. Nominations may be made at any time to the Awards Committee Chair, Gareth Hinds (gareth.hinds@npl.co.uk). Honorary Fellowship is awarded in recognition of outstanding service to the Institute over many years. The recipient is bestowed the suffix FICorr (Hon) and all future membership fees are waived. Nominations for Honorary Fellowship must be submitted via Council. The T.P. Hoar Award is presented to the author of the best paper published in the scientific journal Corrosion Science during the previous calendar year. 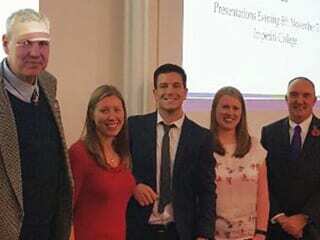 The winning paper is selected by a sub-committee of the Corrosion Science Division and the author receives a certificate and a cash sum of £300. The Galloway Award is presented to a student author for the best publication describing original research in corrosion science and engineering, as judged by a sub-committee of the Corrosion Science Division. The winning paper is published in Corrosion Management and the prize consists of a certificate and a cash sum of £250. The Institute does not retain copyright of the material so this does not prevent separate publication of the work in a scientific journal. Submissions (in the form of papers published within the past 12 months or draft publications) may be sent via email at any time to the CSD Chair, Julian Wharton (J.A.Wharton@soton.ac.uk). The Lionel Shreir Award is made to the best student presenter at the annual Corrosion Science Symposium. Selection of the recipient is carried out by a sub-committee of the Corrosion Science Division. The award consists of a certificate and a cash prize.